This would mark my blog's first post on cupcakes. 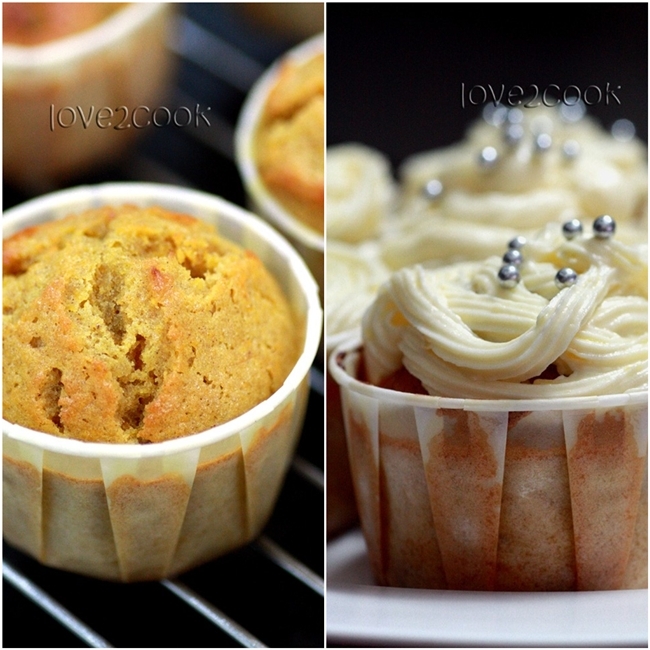 I've actually tried and tested few cupcake recipes. Some were excellent, some were just okey. Sharing an extraordinary with you all today! Sift together flour and cinnamon powder into a large bowl. Add the remaining ingredients and stir until well combined. Mixture will be quite runny. 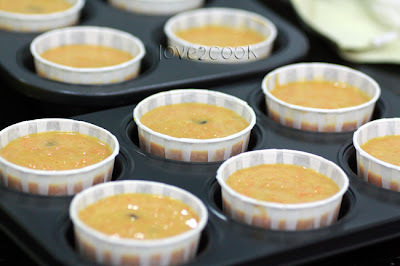 Spoon mixture into prepared cupcake moulds. Bake at 180°C for 20-25 minutes. Cool on wire rack once done. For Icing :~ Beat all ingredients except for pecans until smooth. Top the cuppies with icing and sprinkle pecans over. *** The carrots I bought were not sweet enough, thus I added more sugar. Delicious cuppies...especially when you have it chilled. Enjoy! Ohh this is one of my mom's fav! I've found the buttermilk Love!But didn't buy it coz the expiry date was quite near! Carrot cake with cream cheese frosting is a delicious combination! They look very prettywith those silver beaded sugar. Your carrot cakes look yummy. I dah lama tak baking, rindu pulak. OOoooo... I love carrot cake with cream cheese icing ! Yours looks perfectly delicious. How I wish I can have one now ? :) I find that coffee bean sells great carrot cake but it's soo expensive... And since I learn to bake this, I have stop buying from them. Heehee ! 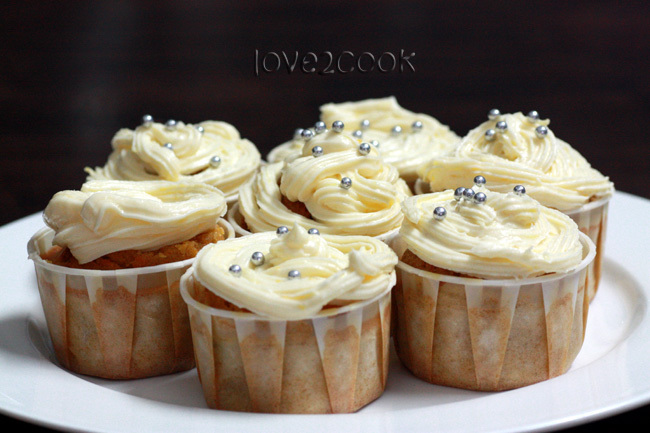 good one.. cream cheese icing over carrot cake looks divine, esp. silver coated sugar beads.. yummy!! So tempting and very inviting !! So yummy yummy !! congrats love!! for ur first cupcakes..
Wow... what a beautiful and tasty treat that is! This is one of my fav cake and cream cheese icing.. i am totally craving for one.. yumm yumm:)ur killing me by showing the textures inside...:( it tempts me a lot. What wonderful cup cakes and beautiful frosting! Lovely clicks. Loveeeee so tempting tgk cc tu akak ni mcm2 masuk list semua belom try,hehheh,Love tu la akak tgk the blender tp hubby dah beli brand lain tp nmpk mmg bestkan which model u use? Wowwwwwwwwww.. So cute and delicious cup cakes.. looks really awesome dear.. Gr8 job.. thanks for the nice recipe.. AMAZING CLICKS !!! LOVE... may I have some? I want to enjoy it with my black coffee...... hmmmm... so yummy...!! 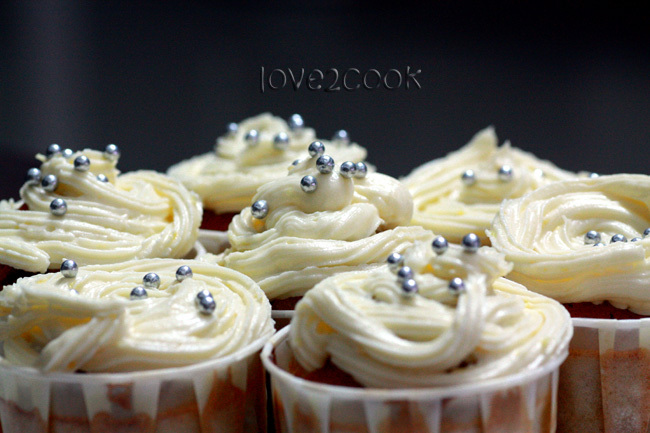 long time didn't bake any cuppies... yours look so delicious with the cream cheese on top! this look so beautiful ! and I love carrot cake but not my kids, hehehe.. They look so beautifully baked and delicious! Scrumptious and great looking cupcakes..yumm! Wow cake looks moist and yummy!! 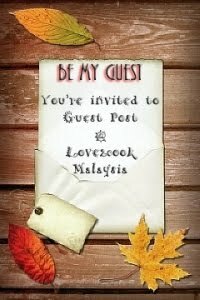 cantik, menarik dan mas tertarik tau..
wow perfect,love the frosting...very tempting pics...fabulous. I love carrot cake too, especially with the cream cheese topping. These cupcakes look very tempting & yummy! 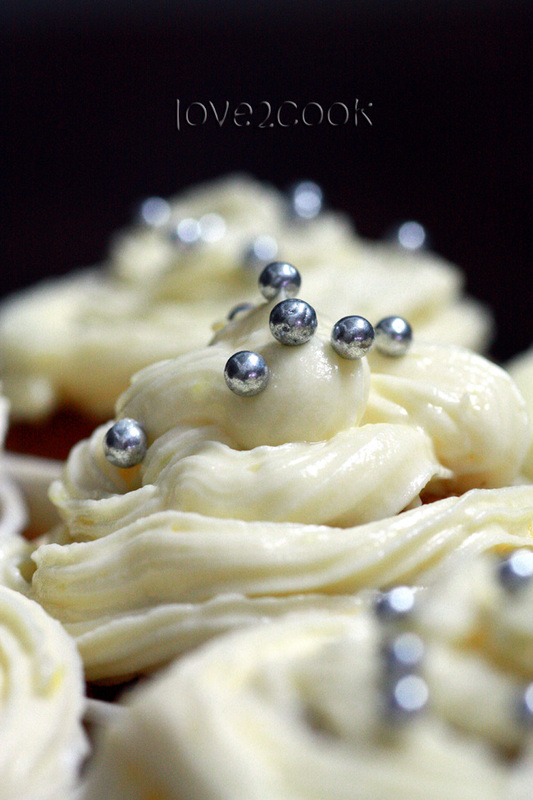 Luscious looking cup cakes with lovely frosting dear. The frosting looks very pretty but I will "attack" the cake first as I am not a big fan of frosting. Delicious cupcakes looks so divine. loved the cupcakes dear...wuld surely love to give it a try sometimes ! 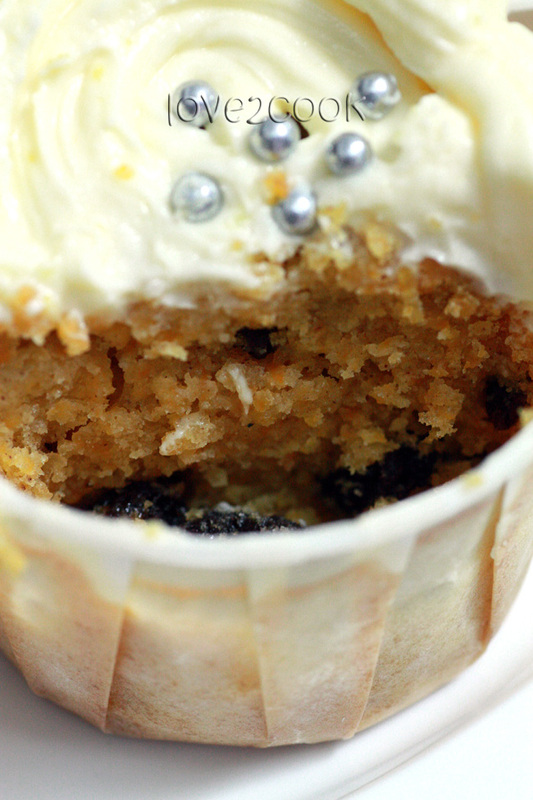 Oh My, you have me drooling - cupcakes, esp with carrots are irresistible! Photos are GR8!!! Cup cakes look so so pretty,lovely shots,cute muffin liners too! :) Yummy recipe! Beautiful cake. I just wish I can kick off this lethargy that is engulfing me and try these cakes out. Maybe later.